This is the absolute best oven roasted chicken and vegetables recipe! It is easy to prepare, the chicken is moist and delicious, and the vegetables are tender and flavorful! The best part of this recipes is that you fix it and forget it, and your entire meal will be ready at once. 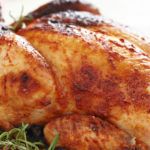 Perfectly browned oven roasted chicken yet moist and flavorful inside. Oven roasted chicken has always been viewed as a comfort meal. 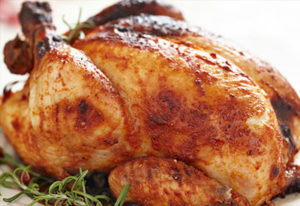 There is just something about slicing into a whole chicken with the flavorful juices flowing down onto fresh vegetables. The good news is that this classic comfort food is actually healthy for you! You can add whatever vegetables to your roasting pan that you prefer. We use the standard trio of onions, carrots and potatoes. But you could also add in other root vegetables as well. Be sure to toss your veggies in olive oil so they become crisp on the outside and soft and tender on the inside. Then season with salt, pepper and fresh thyme sprigs. The thyme leaves will fall off the stems, leaving you with perfectly seasoned roasted vegetables. The key to this moist and delicious oven roasted chicken is the addition of lemon, garlic and thyme stuffed in the cavity of the chicken. The lemon infuses additional flavor and moisture that the meat absorbs. The garlic and thyme add a hint of flavor that will make your mouth water! With all meat recipes, it is important to cover and let the chicken rest before serving. The resting allows the liquid to absorb back into the meat and not leak out onto your serving platter when slicing. If you have any leftover meat, shred and refrigerate for use in other recipes later in the week! Moist and delicious roasted chicken with tender vegetables! Healthy comfort food that is easy to prepare - just fix it and forget it! Clean out the center cavity of the chicken and rinse chicken with water then pat to dry. Let sit at room temperature, uncovered for 30 minutes to dry off. Cut the lemon and garlic in half through the middle. Salt and pepper the inside of the chicken and add 3/4th of the thyme, and entire lemon and garlic halves. Brush the outside of the chicken with melted butter and add salt and pepper over the entire chicken. Coarsely cut the onion, carrots and potatoes into medium sized chunks. Place in the bottom of the roasting pan. Drizzle with olive oil and toss to combine. Sprinkle with salt, pepper, and add the rest of the thyme to the vegetables. Place a rack in the bottom of the roasting pan and place the chicken, breast side up, on top. If you don’t have a rack, add chicken directly on top of the vegetables. Place in the preheated oven and bake for 90 minutes or until a thermometer inserted into the thickest part of the thigh reads 165 degrees F. Cover and let rest for 20 minutes before serving. ← How To Boil Eggs – Come out perfect every time!